Pink base card with glitter sticky paper [from Hobbycraft] as a backing paper. Flowers are from The Works and Flourishes are cut with a Marianne Creatable Die. Ribbon and Bow are from my stash. 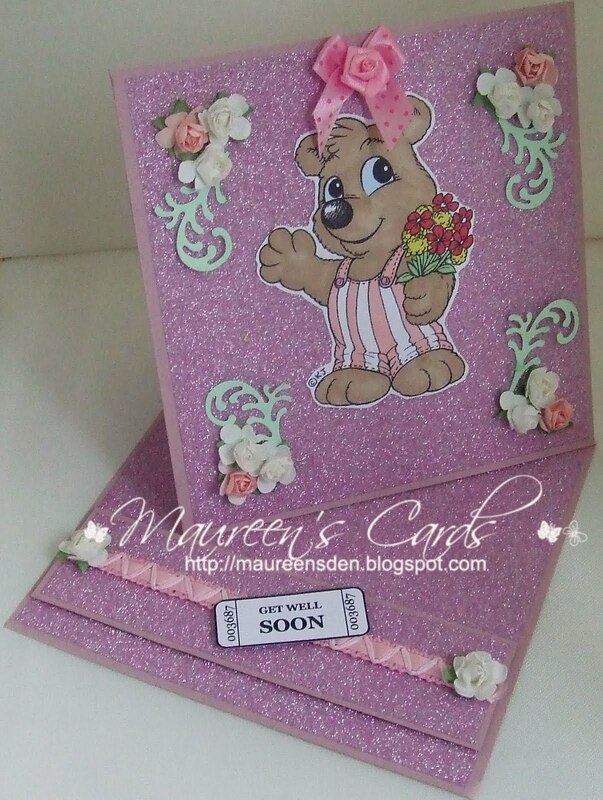 Image is 'Flower Bear' from Karen's Doodles and you can get it here. I am entering this card into Karen's Doodles Challenge for this week. Lovely card, Maureen:O) Love the sparkling paper and cute design. Thank you for joining Karen's Doodles, good luck! Maureen, this is just adorable. Flower Bear looks so cute. Good luck and thanks for joining in on the fun at Karen's Doodles challenge blog. This is GORGEOUS!! I love your colouring and that sparkly paper is yummy!!! NEAT easel card, I love the shape. THANKS for joining us at Karen's Doodles this week! !